Back to school means school supplies. While it is possible to get much of your stationary supplies at discount dollar stores, the saying comes to mind: “You get what you pay for.” Getting cheap pens, pencils, markers, erasers, highlighters, etc. are just a waste of money as they will either work poorly or not at all. Plus, teachers do grade on presentation as well and do not look favorably on sloppy homework with ink and lead smudges everywhere. If you haven’t tried Pentel products before, I recommend that you do. These are really high quality writing instruments. I never paid attention much to the writing supplies I use so it was very surprising to find how much I liked these Pentel items. My daughter’s opinion was also important to me. If she doesn’t like something she won’t use it – and boy, does she enjoy using these. RSVP RT Ballpoint Pens: These pens are so comfortable and they write so smooth. I had to double-check that they were really ballpoint because the ink flowed like a gel pen. The RSVP RT also creates consistent, solid strokes. These are now my favorite pens for everyday use. Twist-Erase Express: My daughter always uses up the eraser on the top of her pencils so she thinks these were fantastic. She kept twisting the eraser, taking it off, putting on the refill, twisting it down, and then repeating the steps. HandylineS Highlighter: Say ‘good-bye’ to dropped and lost caps (so irritating). This is a retractable highlighter that has a cover inside the barrel to prevent the ink from drying out. It does not bleed through paper and I didn’t notice any smudging. Sign Pen markers: With a fine tip, these are perfect for meticulous accents. The colors are bold and can create minute details. These are not coloring markers for your three-year-old but could be better appreciated by your aspiring artists that are a bit older. You can save so much by buying quality products that last all year or more, instead of constantly replacing cheap ones. 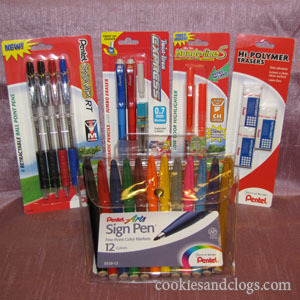 Pentel items are actually very reasonable, especially since they are sometimes on sale or coupons are available. You can also keep up-to-date on new products on the Pentel blog. Make sure to add some or all of these items to your back-to-school supply. Pentel wants three of my readers to receive the same set I did including a Twist-Erase Express 2-pack with Lead and Eraser refill, 3-pack erasers, Handy-lineS Highlighter with refill, 12-pack Sign Pen felt tip markers, and an RSVP RT 4-pack. Visit Pentel and tell me your favorite item. Giveaway ends 9/26/10 at 11:59 PST. Open to US residents only. Winners have 48 hours to respond before a new winner is chosen. Disclosure: I was provided with a set of Pentel products at no cost in order to test the product(s). The review presented here is 100% my honest opinion. My favorite item is the Color Brush. The EnerGel® Alloy RT is my favorite. My favorite is the Sunburst White Gel Pen . I would like to use the Pentel Arts Color Brush pens when I’m making my scrapbooks. I like Pentel R.S.V.P.®: Medium Line. My favorite product is in the Featured Products line called Color Brush! My favorite is the RSVP medium ballpoint pen! I like the color brushes. I love the outline markers!! I like the Pentel RSVP Medium Blue ball point pens. My favorite product is the Outline Marker. I’m going to say the color brush, but the site wasn’t working for me properly so I didn’t get to do much browsing. Almost everything I clicked on gave me error messages saying things didn’t exist! I love what you can do with the color brushes! I like Slicci Gel Pen. I like the Slicci gel pen. I visted, but the site was having issues…. however I know I LOVE their rollerball pen line! Hi, my favorite Pentel product is the HyperG Fine Line pen. I “Like” Cookies & Clogs on Facebook (FB name: Maddie Brubaker). I “Like” Pentel on Facebook (FB name: Maddie Brubaker). I follow Cookies & Clogs on Twitter (@shala_darkstone). I follow Pentel on Twitter (@shala_darkstone). I voted for your blog today on Top Mommy Blogs. I voted for your blog today on Picket Fence Blogs. I like their roller ball pens. Also use their highlighters. Great site! And liked them on Facebook. . .
and follow via email. . .
and follow via GFC. . .
voted at top mommy blogs. . .
i like the Outline Marker. I like the EnerGel Alloy RT. I voted for you today on Picket Fence Blogs. I love my Energel Purple (needle or metal point!). I like the energel alloy. I like cookies & clogs on facebook. I like Pentel on facebook. I follow Pentel on twitter. i voted at top mommy blogs. I voted at picket fence blogs. I voted at top mommy baby blogs. daily vote at picket fence blogs. I like the pentel arts collection. I love their gel pens. i like the Permaroller Gold pen. I love school supplies! I think I’d like to try the Jolt 0.5mm pen. It’d be good for meetings. My favorite is the Light Green 4 Color Pen. A traditional fountain pen is so elegant — definitely my fave! “Liked” Cookies and Clogs on Facebook! Already “like” Pentel on Facebook! Already follow @PentelofAmerica on Twitter! Commented on a non-giveaway post! I like the Metallic Brush pens. I like the Oh Gel! Pen in blue! I ” like ” you on facebook. My favorite Pentel Product is the RSVP pens. I have loved them for years. They are amazing. I love the Handy-line S Dry Erase Markers. Thanks! I like the Presto Correction Tape Pen. I like the color brushes! Love the Handy-line S Dry Erase Markers. RSVP fine point black is my absolute multi-purpose favorite. I follow on GFC w/Randominities. The Pop n Pop Correction tape would be helpful for school projects! I like the Pental Outline Markers!! I like the Pental Permaroller Gold. I love their Energel delux think pink pens!! My favorite products are Pentel’s Oh! Gel pens. I love pens and markers. i want these! Thanks for the giveaway…the EnerGel Alloy RT is my favorite Pentel writing implement ! MANDATORY ENTRY: My FAVORITE Pentel product is their Pentel Arts Pocket Brush! My favorite pentel product is the Oh Gel pen in blue. I follow pentel on twitter as kmayans. I like the HyperG Fine line! I like pentel on Fb! I follow pentel on twitter! I’d like to try the Energel Needle Tip. Thanks. Voted at Top Mommy Blogs. thanks. I like the Gel Roller for FabricBN15…very cool, thanks. The Lancelot Fountain Pen is my favorite item. I checked out Pentel and my fave item is their Outliner, I love those!